It grew hotter and we soon peeled off our jackets and worked a solid hour until I thought I would just die right here. Why couldn't she have had an affair in Rome? I would have an Italian father who wore beautiful shoes. 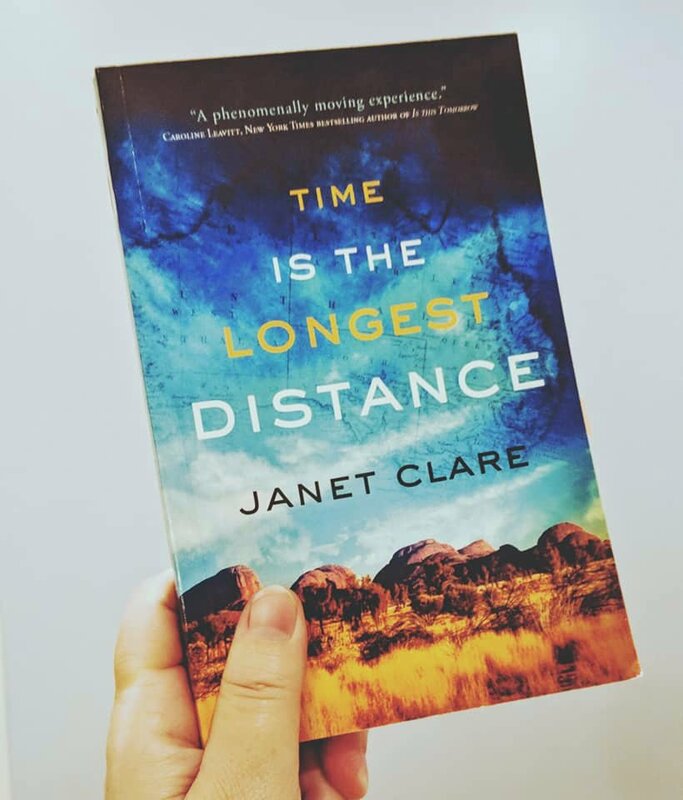 Time is the Longest Distance by Janet Clare is about a middle-aged woman who finds out her deceased father was not her biological father. Instead, she was conceived during a brief affair when her mother traveled to Australia. After she calms down, Lilly contacts her biological father, Cameron, and goes to meet him and her half brother in Australia. He is a taciturn man and Lilly isn't sure it was worth the effort to come meet him. But, then he suggests that she accompany him and her new family on the Canning Stock Route, a dangerous track across the outback. Like a moon walker far from her life, LIlly becomes entangled in an unlikely love affair and witness to an unsavory death. The hard days and long nights provide time and space for Lilly to recall the years with her ex-husband, Stephen, artist and all-around drunk -- the greatest love and disappointment in her life -- forcing her to examine her own imperfections as she learns, first-hand, about the power and destruction of secrets, sexual taboos, and the thrill of transgression. One of the most fascinating things about Time is the Longest Distance is the publisher. Written by an American, the book is published by an Australian press in Melbourne. If nothing else, that tells you how authentic the descriptions of Australia must be. And, I did find that it matched what I've read by Australian authors when describing the desert region, like John Marsden in Tomorrow When the War Began. Recommended - I had mixed feelings about Time is the Longest Distance. It has a melancholy tone (which I tend to dislike) and deeply flawed characters (which I'm okay with, although it can be uncomfortable) but the writing is solid. I was particularly awed by Clare's use of the senses, which are visceral. You can feel the heat and rain, smell the sweat. Stephen's daughter Jen is the only really likable character but she does keep the others from becoming intolerable and I loved the outdoor adventure/survival aspect of the book. Note: At 209 pages, Time is the Longest Distance is a quick read but you may feel like you've just traversed the desert and need a bit of a lie-down, after. I received a copy of Time is the Longest Distance from the author. I don't normally accept books from authors for review unless I know them personally so I have no idea what I was thinking, the day I said "yes" (although I was probably swayed by the setting) but I'm glad I accepted it. However, it's a one-off so if you're an author, please don't ask me to review your book directly -- if you'd like a review, I'd prefer to deal with a publicist. Thanks, Janet! I've never been a big fan of books that have a sad tone. I feel like life is dark enough most of the time, so I like to read happy books. But I'm glad to hear the writing in this book was at least good. A good writer can frequently make up for a plot that is less than my reading ideal.